Weeding can be tedious, miserable work. Hard on the back, hard on the hands, and downright painful in much of my garden, where nettles and thistles grow exuberantly. But there are some perks. Weeding brings you close to the vegetation, and gives you a chance to see things you might otherwise miss. Today I was treated to two native orb weaver spiders—two of my favourite native spiders here. The first was a bright green, round-bottomed Colaranea viriditas—the green orbweb spider. These little gems are supposedly quite common, but the bright green ‘leaf’ on their backs must do an excellent job of camouflaging them, because I count myself lucky when I see one. Unfortunately, my camera was nowhere close, and this one scurried away before I could catch it. The second orb weaver I saw today is an expert at camouflage. You would be hard pressed to recognise it as a spider at all most of the time. This spider is in the family Tetragnatha—the big-jawed spiders. 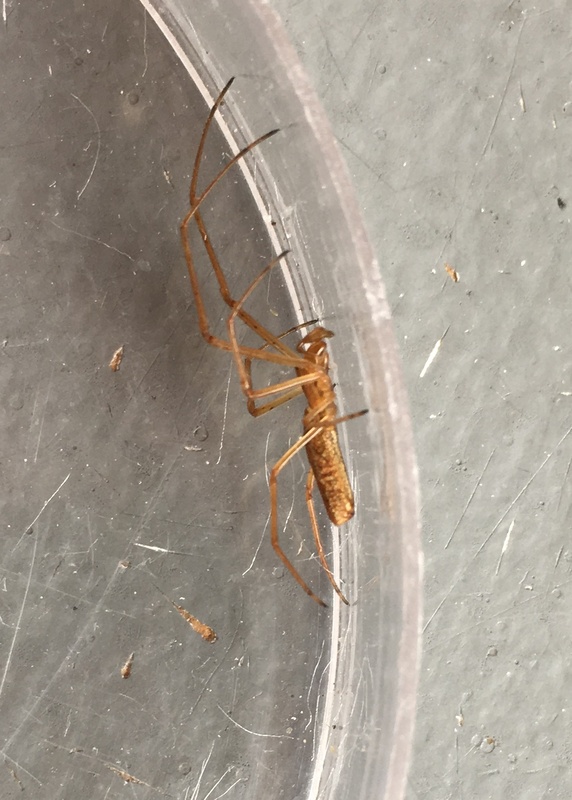 Tetragnathids have long thin bodies, and sit with their legs stretched out to the front and back, making the spider look like a small twig (I had to poke the one pictured here so it would stand up and look like a spider for the photo). Tetragnathids are usually associated with wet areas, so I’m not sure what they’re doing in my dry yard, but they’re certainly common here. Though they’re hard to see, you can’t swing a sweep net in the tall grass without coming up with a few of them. Both these spiders catch flying insects in webs shaped like the classic Halloween spider web—orb webs. Is it a coincidence that I saw them both today, a week before Halloween? Maybe they’re practicing for their big night. Or maybe it was just my lucky day.